Today we continue our County Geography series, with Lee County. 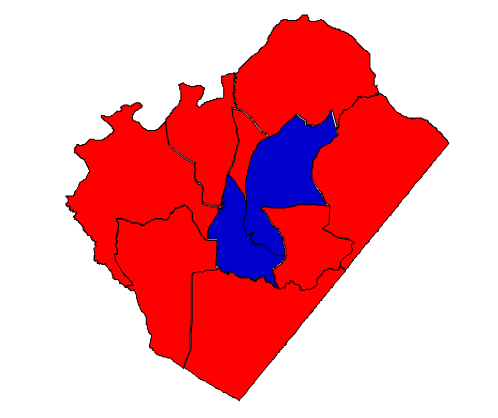 Lee County is located in the central part of the state and divided between the Piedmont and the Sandhills region. The county seat is Sanford. Thanks to a heavy minority population, Sanford is a strongly Democratic area. But the outlying rural areas are much more Republican. Lee County has a PVI of R+13, meaning it is strongly Republican. But it is not so strongly Republican that Democrats can never compete here. In fact, Kay Hagan won Lee County in 2008, but by a small margin. Future prognosis: Unlike other counties in North Carolina that have changed dramatically, Lee County has not changed much at the presidential level. Lee, however, has trended Democratic for the last two elections in a row. This could be a coincidence, or it could be a sign for optimism for Democrats here in the future. One thing that Democrats should definitely be excited about is the high percentage of Hispanics within the county. At 18.6% Hispanic (2011 census estimate) there is room for growth in the Democratic vote. There is evidence that the Obama campaign succeeded in registering more Hispanics during the 2012 campaign. Democrats should seek to register as many of these unregistered, Democratic-friendly voters as possible, and most importantly – get them to vote. Thanks in large part to the rising Hispanic population, the county’s growth rate was a healthy 18.0% from 2000 to 2010. Evidence shows that this growth benefited Democrats. But Democrats shouldn’t get too ahead of themselves – while not as Republican as it used to be, Lee is still a strongly Republican county. Lee County is also at the center of the fracking debate. It is anyone’s guess how this will affect the political makeup of the county.